When you have lost count of the times, you have visited a city you begin to enjoy it in a very different way when you go as a tourist with little time. The possibility of approaching to places that normally would not be in your route, but that you should take into account if you go to something near. St. Dunstan in the East is one of those places, is the haven of peace in the heart of London, where you find the same person reading or an executive with his food looking for solitude. 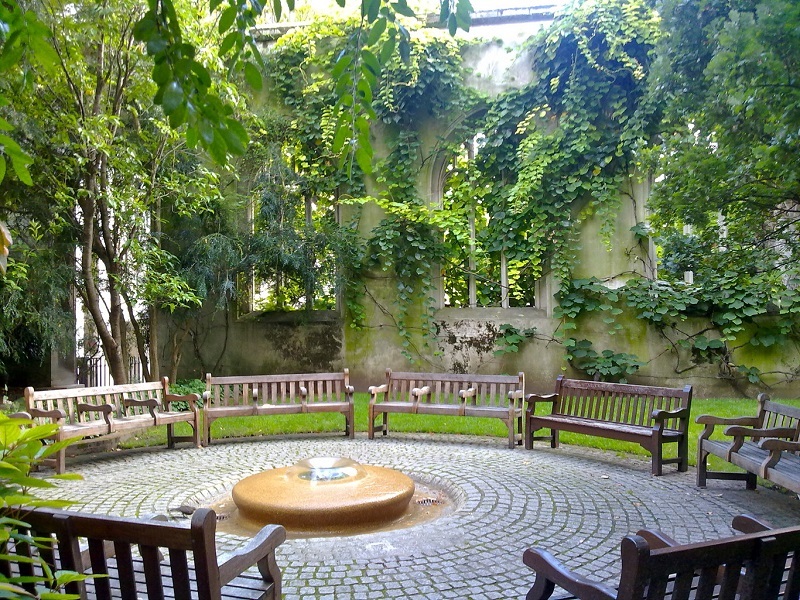 It is a wonderful garden that was not designed as such, but as a parish church with only its four walls and the tower remaining after the bombings that swept London in 1941. As with the Kaiser Wilhelm Memorial Church in Berlin, like a macabre memory but in this case to provide rest to the body and soul. It is one of the best kept secrets of an area of London that ended completely devastated by the Blitz. Halfway between the London Bridge and the Tower of London. The original church dates back to 1100 and resisted until the Great Fire of 1666. Instead of throwing it out and starting over, complete it rebuilt with designs by Christopher Wren (his is St. Paul’s or the Library of Trinity College of Cambridge) which he added The belfry. Nearly 50 churches in London carried their seal after destruction. The walls are covered in summer, its busiest time, by ivy and flowers and the benches are a fantastic shelter from the heat because the walls keep the place cool and silent, with the only soundtrack of the birds singing. Of course, in winter the proximity to the Thames make it a refrigerator. 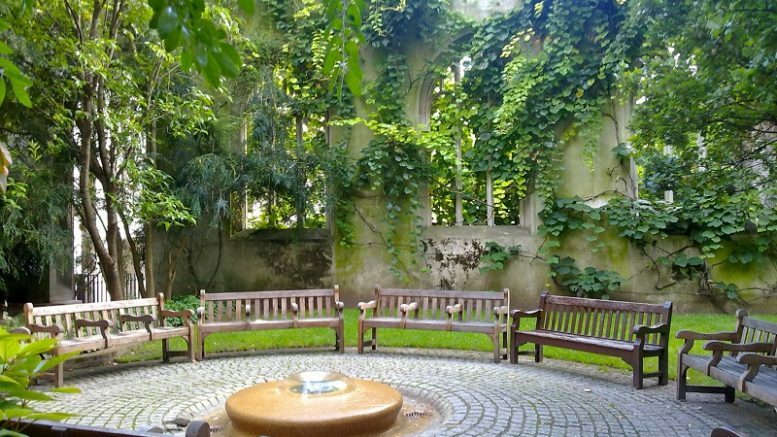 As a ruin in the middle of new construction and without deciding what to do with it, in 1967 the City of London Corporation had the great idea of covering the ground with grass, adding the benches and trees and installing the fountain. It opened in 1971 and with that British custom of giving prizes to the gardens, since then it has taken many. Besides nature and its free growth gives it a charm that have no other places. If you look at it in a travel guide and you think you do not want to get out of the way, my humble opinion is that you make a mistake. It is just a few minutes from the Tower of London and is the perfect place to take a break from your tired tourist feet. In addition, at specific times of the year continues to exercise as a church and hold some office, as on Palm Sunday, preceding a procession. Be the first to comment on "St. Dunstan in the East, the haven of peace in the heart of London"